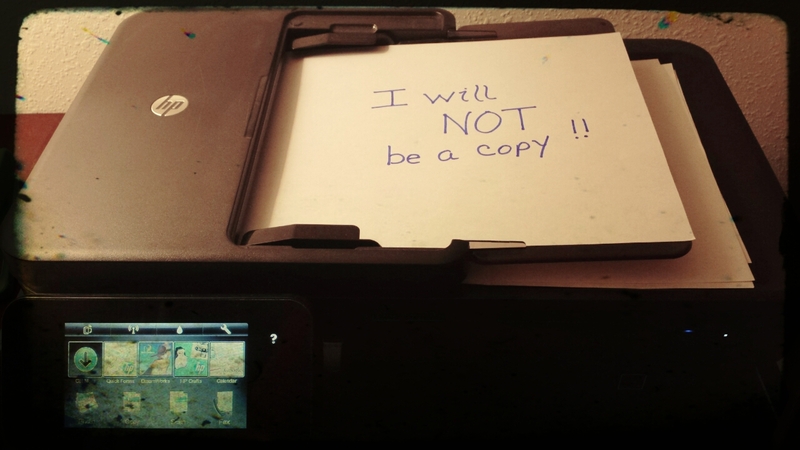 Don’t Die a Copy – Go Out an Original! I wake up most days excited, wondering what moment will present itself as inspiration for me to write. It drives me to look for something profound and unique in every day. This morning Pastor Darlene Bishop shared a quote by the late Dr. Myles Munroe; “Everyone is born an original, but many die a copy.” I found that to be so profound, on so many levels. Step onto a playground or into a grade school classroom and at one point you will likely hear “Copy Cat! Copy Cat!” or the ever popular yet whiny “He’s copyin’ off me!” Why? We don’t want anyone stealing our ideas. At a young age we know we are original. But humans also long for love and confirmation. Jill draws a flower and mom gives her praise and hugs. Watching that unfold, Jack picks up his crayons and draws a flower, anticipating that same praise. Jack didn’t realize it was not what Jill drew that caused the mother to shower her with love and affection, it was simply the fact that she was her daughter. Jack could have drawn a truck instead of a flower and he would have still gotten showered with praise. It wasn’t what the children drew that caused the mother to love them, it was the fact they were her children. Sometimes, even as adults, we forget God loves us not because of what we’ve done, but for who we are. Pastor Darlene reminded us that as Christians we are also not meant to copy one another. We should be praying and earnestly seeking God’s will for our lives and the church. Many spend too much time looking at what is working for everyone else and try to mimic it expecting the same results. We should be spending our time talking with God and asking Him to show us our purpose. Paul started all of his letters to the churches with a warning “Do not be deceived”. Just because it’s big and has a cross on it, doesn’t mean it’s of God. When you are walking in God’s will, fulfilling your purpose, it all works out for good! We all have different talents and abilities. I love to sing. I’m not afraid in front of large crowds. I would love to be part of the worship team. There’s only one small problem…… I can’t sing! 🙂 Trust me, if I was to sing, the only blessing would be when it’s over! I could waste my time taking singing lessons, trying to make myself better. Instead of wasting time, energy and money on trying to become something I’m not; Instead, I choose to embrace those talents I’ve been blessed with and spend the time trying to make my corner of the world a better place to be. We had a ministry head meeting today in which Pastor Jason summed it up so very nicely; “No one ministry is more important than the other. We all bring different gifts to the table that helps to fill different needs in the church and in the community. But we all serve with one common tie that binds our uniqueness together – LOVE! !” As for me? I fully intend to leave this world an original!